Standing (from left) Carlos Calderin, Jr., Captain Jeff Kaplan, Sam Passow, Carol Rauscher and Tarrant Anderson. Kneeling (from left) Tom Greeley, Corey Parker and Gabe Perrone. ENGLEWOOD, N.J. —— On Nov. 29, Englewood kicked off its annual Toy Drive, an event sponsored by the Englewood Chamber of Commerce (ECC) and run jointly by the Englewood Police PBA Local 216, and the International Association of Firefighters Englewood Local 3263 and Englewood Fire Fighters Local 3260. Throughout the Toy Drive, members of the police and fire departments volunteer their time, which for most, means dozens of hours of collecting, wrapping, boxing, transporting and delivering toys. The boxes for the toys are donated by UPS in Englewood and printing for the campaign is donated by Print Solutions. The Englewood Toy Drive runs until Monday, Dec. 18. After the closing date for collections, Englewood police and firefighters bring all the cartons of toys to the fire station in Closter, which serves as the central warehouse for the colossus of donations collected from 50 towns in Bergen County. The amount of toys allocated to each town corresponds to the number of families that each town has on its list of registered recipients. Families that are eligible to receive toys are selected based on need, and that number increases every year. The Toy Drive started small 13 years ago, and it has grown into a major event. 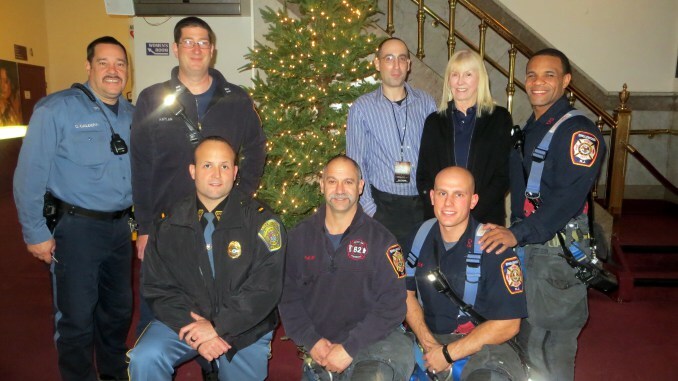 Three years ago, it became a joint effort of the police and fire departments, and they now share the collective haul of toys with other towns in Bergen County. Over 350 families received toys last year. Donated toys span a wide range of items that are appropriate for newborns up to teenagers – from dolls, games, Legos, remote controlled cars, iPods, to action figures, jewelry kits, art supplies and much more. Some donors who do not have toys on hand donate gift cards. On Dec. 21, excitement of the Toy Drive will come to a crescendo, as Englewood police officers and firemen hand out thousands of the toys in the cafeteria of the Dwight Morrow High School to a crowd of delighted children and parents. As in past years, the school’s cafeteria will have Christmas decorations galore, refreshments and jolly old St. Nick. The highlight, of course, is the toy bonanza, which always results in huge smiles and hugs. Last year, enormous plastic bags stuffed with toys were distributed to 350 families. Englewood fireman Anderson, like his colleagues, is eagerly looking forward to this year’s festive Toy Drive finale at Dwight Morrow High School. “It’s so good to give back to the community, and there are so many underprivileged families whose children would not have Christmas gifts without this. It’s really wonderful,” he said. Capt. Kaplan has fond recollections of Toy Drives in past years. At the Toy Drive kick off meeting, Passow summed up the bergenPAC’s commitment to the program.